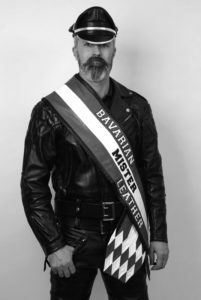 What a premiere: The first Bavarian Mr. Leather was elected as the International Mr. Leather in Chicago just two months later. The Nuremberg guy, also known as good DJ, could score with his charm, looks and a great voice: “Hopelessly Devoted to You” was his song, whereupon the audience was “hopelessly devoted” to him. Alexander succeeded the IML with a strong but pleasant portion of Bavarian tradition. 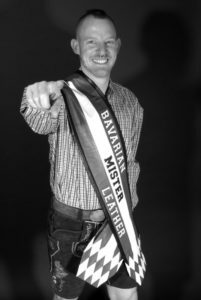 The enthusiastic Sch(w)uhplattler (gay shoe-slap-dancer) entered the stage in leather and with a whip – however, contrary to common fetish notions, in traditional Bavarian leather and with a traditional whip, the so called Goaßlschnalzer. He never put his love for his homeland in question at national and international events. With his 1.94 meters, he is still the “biggest” of the Bavarian Misters: The Franconian master hairdresser, media designer and computer scientist convinced Munich’s community as stripping U.S. Policeman. Since there was no Bavarian Mister election in the two subsequent years, Robert indirectly had the longest tenure as BMrL. The appearance of the Rhinelander at the Oberangertheater was perfectly staged eroticism – and this physical commitment got rewarded: With a beaming smile, a confession to faith, and his registered partnership he also convinced in other respects. With charity events during his tenure he particularly tried to bring together the different groups within the community. Although the Berchtesgadener had no opponents, he was anything but a stop-gap. The social education worker and IT specialist saw himself as unifying figure between the fetish and the non-fetish scene. With new ideas, he especially took care of the young, which didn’t surprise, since he used to be the leader of a youth group. The fitness trainer used to work as an entertainer for years – which served him even during his appearance at the International Mr. Leather contest. With his seventh place he won the second-best placement of a BMrL in Chicago. His mix of Leather, Rubber and Sportswear causes a stir, but it is deliberately chosen: Max doesn’t want to be put in a pigeonhole, and he’s open for all (fetishes). “Prevent”, “give notice”, “accept help”. 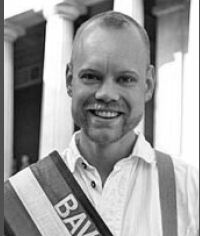 This was Thorsten’s slogan for a big anti-violence project that wanted to show that even “hard men” can become a victim of anti-gay violence. Furthermore he is co-initiator of the alliance for solidarity facing hostility against gay, lesbian and transgender people. We won’t forget his unheard-of appearance at the Bräurosl beer hall during the Oktoberfest meeting. Due to his engagement, Munich’s mayor Ude visited us on our balcony in the beer hall. 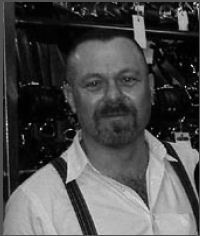 The teddy bear was his trademark – he accompanied Lutz on all his travels and even to Chicago, He made a respectable 7th place at the International Mr. Leather Contest and made it into the “top ten” worldwide. 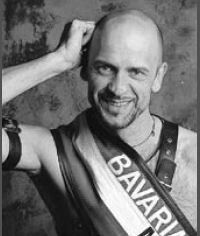 During his year of duty, Lutz gave the Bavarian leather and fetish scene a face and a voice and has been a very welcome guest everywhere with his likeable and open way. None of our BMrL grew so much with his challenges as he did. Until his election, he has been a rather inconspicious member of the fetish community – but during his year of duty (and beyond) he became a shining example for the community. He was our youngest titular ever. He used this “privilege” to take care of the younger part of the community and inspired them fetish-wise. It has been very important for him to meet people – be it at one of the many fetish meetings or one of the CSD’s nation-wide. During his one-year term he grew as a personality and one could tell that he was enjoying his duties. 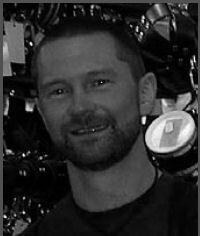 He was the face and voice of the fetish community for one year: Fetish bar at SUB, walking the scene with the “sisters”, Run for Life, CSD’s – there weren’t many events where Thomas has not been representing the MLC and the community. His biggest success was for sure the foundation of the community cooperation between Munich and Kiev, marking its highlight with a visit to Kiev in February 2014. 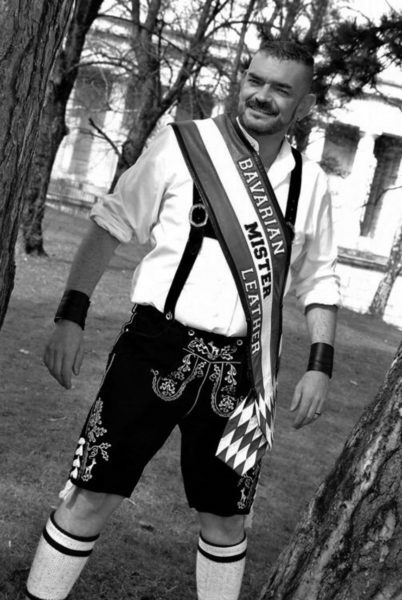 The sympathic Frankonian has been representing the Bavarian fetish scene for one year and has been very well received everywhere especially because of his relaxed nature and his contagious laughter. Ralf set his main focus on the topic “hepatitis” which he carried over during many educational events – also at UnderGround – with big engagement. His appearance on stage at the Oberangertheater was full of musicality, irony and always true to his motto “Show your face”. It was his utmost concern to keep in touch and to keep talking with each other. This is why he has always been in close contact with heterosexual associations and educational groups at schools. 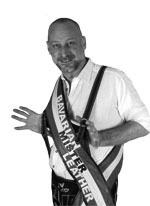 He has been the face of our fetish scene at political events at the Bavarian Parliament and political conventions. And he personally took part as “leather man” in the opening of Jean-Paul Gaultiers exhibition. Despite the diversity and broad opinions in the scene, Andreas’ message has always been: We are ONE community that has to stand together closely as only together we can shape our future. “Only together we are strong” – this was the motto of Werner’s year of duty. 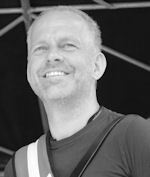 Inspired by taking part in many events – as the CSD in Warsaw, the May Queen election in Munich or the IML election in Chicago – he saw himself as a bridge builder for the community that in his eyes requires solidarity “more than ever”. Also building bridges for the younger generation was important to him. This is why he launched the first “Fetish Information Evening” at “diversity”, the Munich gay-lesbian youth center. Fetish meetings, “Mister” elections, CSD’s… Manfred has been traveling a lot during his term and represented the community on many occasions, being the face of the community. As Manfred lives in the northern part of Bavaria, the Frankonians got to see him more often. This empowered him to also strengthen the connections outside of just the Munich metropolian area and southern Bavaria.